The recent campaign of Volkswagen – Volksfest, cruised through the media with great success. The creative and execution of this national campaign was done by Collateral. From print ads to merchandising support, Collateral was present all through the journey. With the festive season around, Collateral leveraged this opportunity by designing creatives that were in sync with the festive mood and communication that reached out to the masses. The years of experience with Volkswagen enabled Collateral to pull off this huge project, unaided. 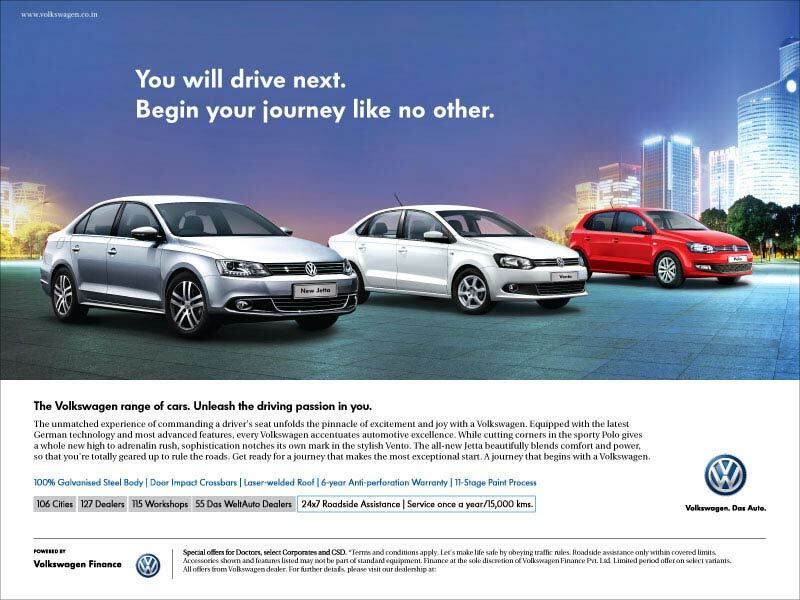 As an agency on record for Volkswagen Dealer Support, Collateral designed the Above the Line (ATL) campaign and also provided creative support to dealers, pan India. On the digital front, Collateral supported the pre-owned car business of Volkswagen – Das WeltAuto. As Volksfest was offering attractive upgrade and exchange offers, Das WeltAuto felt the need to promote these through digital advertising.Collateral was up to the task and designed an effective landing page that drove in maximum traffic and generated quality leads for Das WeltAuto. Search Engine Marketing experts got behind the wheels of digital advertising to promote the Das WeltAuto’s upgrade and exchange offers. Within few days, this SEM project garnered a lot of enquiries on its landing page which resulted in quality leads for Das WeltAuto. Both ATL and digital campaigns were huge success and gave Volkswagen one more reason to celebrate the festive season.